On May 25th Estonian sculptor Tauno Kangro celebrated his 50th birthday. The celebration however was slightly unusual. It was the artist’s long dreamed wish to exhibit at the main city square in Tallinn. This is how a week-long exhibition named “Ancient Force in Rock and Metal” came to fruition and so Kangro exhibited many of his works he had made over the years. There were bronze and granite sculptures from small detailed dancers to 4 meter long monumental sculpture of a well-known mythological character from old Estonian epic. 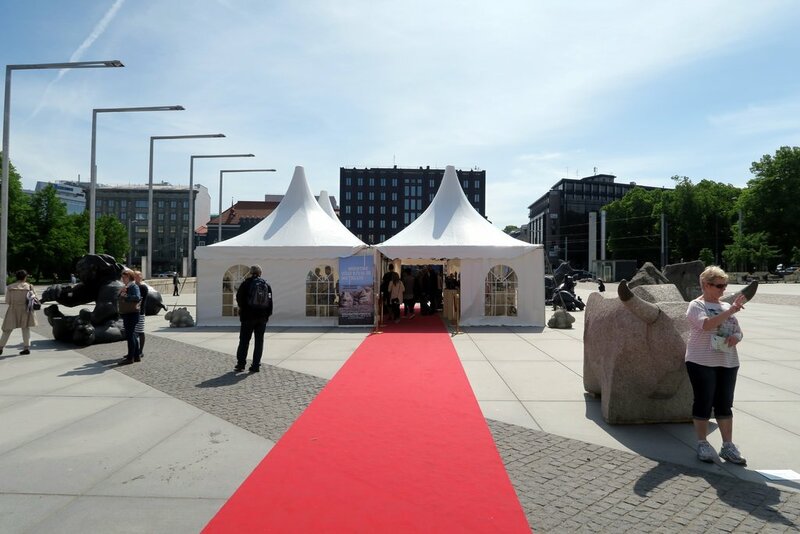 The exhibition was held at the Tallinn Freedom Square in Estonia. See the full photo gallery on Postimees.ee here. Ice has broken off several huge boulders from the Scandinavian massifs. Over thousands of years, they have been polished by water, ice, and wind, giving them rounder shapes. Today, these rocks have been polished further by the artist who has seen the uniqueness in them, and tried to find the character, indivisibility, and magic of each rock. Made from rock, these faces are like the ancient guards of the Nordics, benevolent house and rock spirits, who remember the times both before and after us.